· Colorado where Romney leads by 1.3%. If Romney is able to win each one of these states, he will still lose in the Electoral College by one vote. How likely is it that Romney will turn the trick in all four of the toss-ups? Nate Silver gives the President a 75.2% chance of winning Nevada, a 63.4 % chance in Colorado. In Ohio, the President is given a 72% chance of success. Only in Florida is it close: Romney has a 53.8% chance of winning. Remember, all that will do is get Romney to “close but not quite.” It is easy to see why Silver gives the President a 71.2% probability of winning the election. My own sense of it is that Romney got a bounce from his debate performance, but by definition, bounces don’t last. I think that Romney knows that what went up so sharply will come down before the election. Today, at 2:20 p.m. Alaska time, the HuffPo was reporting that Romney had once again changed his position on abortion. 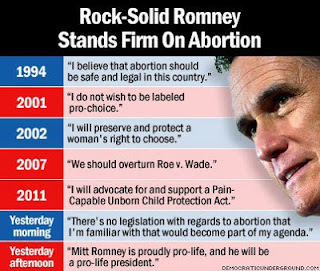 Mitt Romney said Tuesday he has no plans to push for legislation limiting abortion, a softer stance from a candidate who has said he would “get rid of” funding for Planned Parenthood and appoint Supreme Court who would overturn Roe v. Wade.